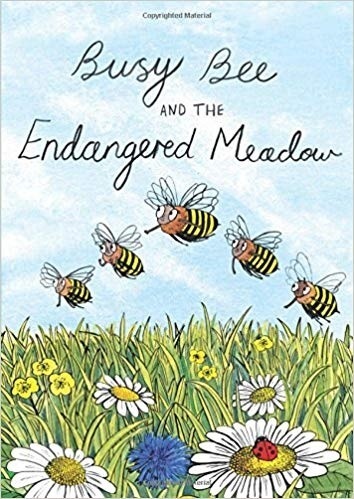 A new book on bees, available for children has recently been published on Amazon. It is about a bee that dons a disguise in order to try and save a meadow from being built over with housing. It is a story with some educational and environmental aspects within the text. It is available from Amazon for the Kindle and devices that have the Kindle app. It is also available from them as an A4 story and colouring book and as a pdf on Jungar Media. Part of the profit from each sale will be donated to a good bee cause. So if you know of any children who would like a good story about bees then I highly recommend this one. Bea Bee is the most resourceful, hardest working and happiest bee living in a hive located in a beautiful meadow. One day she notices a new sign on the gate and goes back to the hive to get wise old bee to come to the gate with her and read the notice as she doesn’t understand all the words. The news is bad; the sign is for a planning application to build houses all over the meadow. Wise Old Bee suggests that only if a rare or endangered species is found in the meadow is there a chance that the meadow can be saved. Bea suggests a wild idea on how to save the meadow from this happening. If they don’t then they are going to have to move the hive. Her plan is fairly simple. There are some red flowers down near the stream that produce some fairly sticky pollen and she thinks that if she disguises herself as a red bee people will believe that there is a new species of bee. At least it will give the bees time to find out if there is a rare or endangered species in the meadow. Time to tell the Queen about the problem and also a possible solution. Bea tries out the deception on two young people camping in the meadow and they take several photographs that they load onto social media. Bea has started a series of events that she is unaware of. Two teams are set up, some normal bees to keep a lookout on when visitors are coming and a “red” team to sow the story and keep each other from being caught. They will now try and convince other people but will experts believe them? Can Bea’s plan and her friends from the meadow find a way to save it from being built on? Oxalic Demo & only one sting! Safe to say – our bees are nice ones!